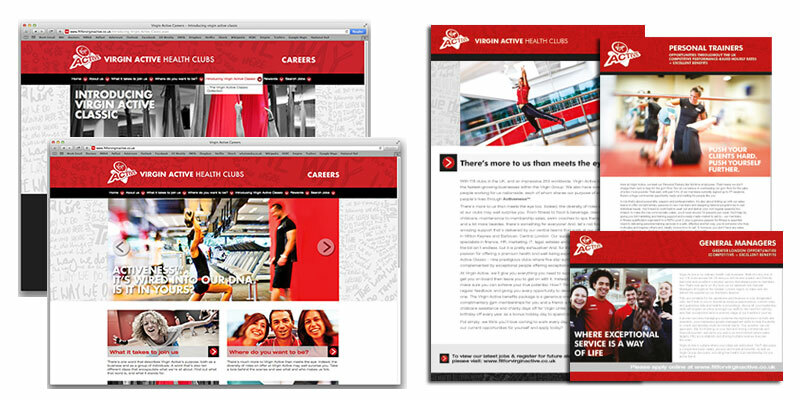 Virgin Active was looking to improve and update their recruitment website to attract and retain the best possible people with the same mindset – people looking to enrich people’s lives through Activeness™. But what is Activeness™? It’s ten different ideas, each one saying something really important about who VA staff are and what they do. WDAD worked closely with Virgin Active to create the new website www.fitforvirginactive.co.uk to introduce the new Virgin Active Classic brand – the premier Virgin Active health clubs. Sitting within the newly launched Virgin Active brand, it was designed to give a real insight into what it’s like to be a ‘Virgin Activist’ within the different clubs as well as promoting the full range of career opportunities available. The site has clear navigation from the homepage, allowing candidates access to important information immediately. Candidates are given a full experience of working at Virgin Active in every aspect of the site. Social media is also part of the recruitment strategy for Virgin Active. WDAD worked in partnership with ATS provider eArcu to ensure our front-end site fitted seamlessly with eArcu’s back office applicant tracking system. The site has successfully handled a huge amount of recruitment traffic, receiving over 400,000 unique visits per year (c.35,000 per month). In the first 4 months of 2014 the site handled over 18,000 applications.